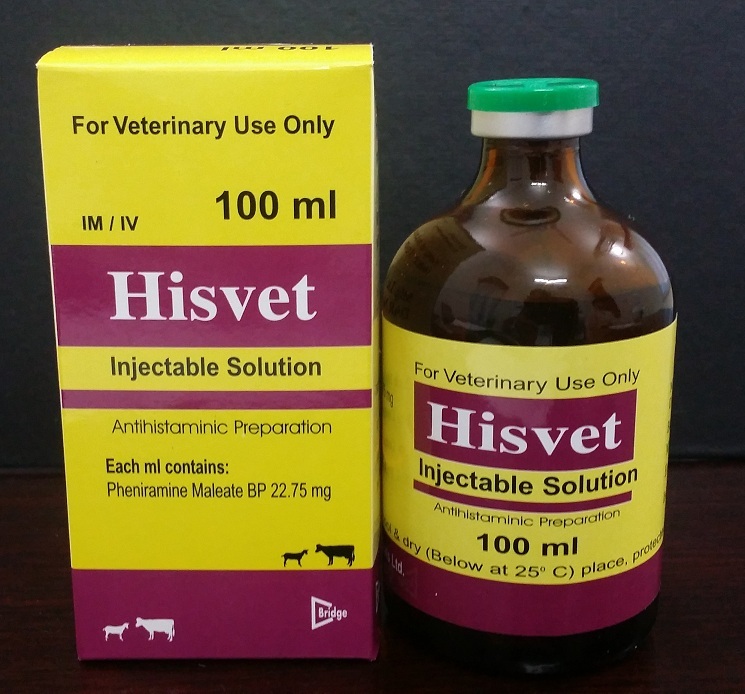 Hisvet Injection | Bridge Pharmaceuticals Ltd.
	An Allergic reaction is assumed to be the cause of the following diseases or symptoms in animals which are cured by Hisvet. Itching of unknown genesis and of various local isations, eczema, dermatitis, urticaria, skin oedema, insect bites, photodermatitis, rhinitis, tail eczema in horses, stomatitis, toxic hoof corns and inflammation of hooves of cattle, serum shock, paresis during pregnancy, puerperal toxemia and secondary retention, pulmonary oedema in cattle, pulmonary emphysema in horses, toxic hypopsia etc.  The efficacy of Hisvet has also been demonstrated in drug allergies, anaphylactic shock, laminitis, bloat in ruminants due to histamine atony f the rumen and also in the treatment of acute septic metritis in cows in conjunction with antibacterial therapy. Hisvet may be administered intramuscularly or intravenously.  The dosages should be adjusted individually. 	If possible small dosages are given first because it has often been shown that anti-allergic drugs are effective in comparatively small dosage.  Injection may be repeated after 8-12 hours, if necessary. 	Vial of 10ml & 100 ml.